Spark New Zealand stunned the market last week in announcing that CEO Simon Moutter is stepping down, effective July 1, 2019. He is to be replaced by Jolie Hodson, currently the company’s Customer Director. With no ‘real’ reason given other than “it was time,” the move is surprising and very strange in our view, given the host of new management initiatives still have time to run (Agile), or have only just been launched (Spark Sport). The transformation under Mr Moutter has been an impressive one, and although his replacement has held senior executive positions during the company’s ‘repositioning, it does feel like the timing of the CEO transition is a year or so early, and creates a number of risks. We note that most brokers in New Zealand are praising Ms Hodson’s credentials and track record –this is no cause to make us any less wary. 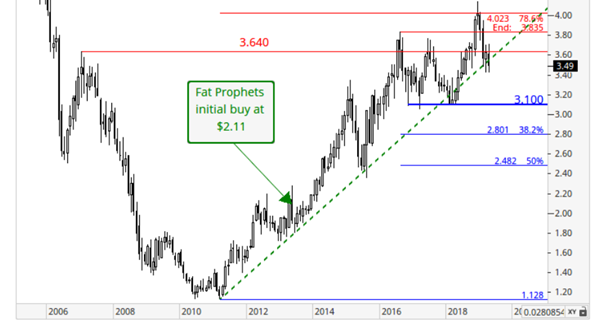 Fat Prophets backed the company’s turnaround plan under Mr Moutter’s leadership since April 2013, issuing an initial buy recommendation around the $2.11 mark. At the time most brokers across the Tasman were overtly negative on the company, but we had confidence the envisaged transformation of what was then Telecom Corporation of New Zealand, would be successful. Such has proven the case, with not only a name change and cost out programme, but also a disruptive story, with Spark putting pressure on Vodafone in mobile, and pursuing other digital earnings drivers, including the move into streaming. This has seen the share price re-rated strongly from the levels of five years ago, accompanied by robust dividend pay-outs. We do harbour some concerns that with the job not quite done yet, a layer of risk has now been added by a change at the top. Particularly if current initiatives are not executed on properly, or indeed should there be a change of strategic course (Ms Hodson has stated that this will not be the case for the record). We have no problem with Ms Hodson’s track record per se. She has been on the telco’s senior leadership team since 2012, and has delivered ‘outcomes’ across a number of business units. She has been a key driver of the company’s growth strategies in Cloud and IT services, and headed up the Spark Digital unit, and was CFO. A box has also been ticked as the corporate sector move towards having more women in leadership positions. Ms Hodson, with Chair Justine Smyth, will occupy the two most senior executive roles. The main problem we do have is that Simon Moutter, the executive whose turnaround program we have consistently backed, is going. We appreciate that moving from a ‘buy’ to a ‘sell’ recommendation is an abrupt switch, but the circumstances are also somewhat exceptional. Regardless of the magnitude, the undeniable fact is that a layer of uncertainty has been added to the investment case that was not there a week ago. Succession planning has occurred, but this has been poorly communicated to the market in our view, and regardless of how ‘good a game’ is talked, there is now the real risk of a change in strategy. Not much has been made of the fact that a few days before the announcement of Mr Moutter’s departure, Spark revealed it was seeking a ‘growth partner’ for Lightbox. The SVOD service has been a success in that it has 355.000 subscribers, but is likely to be still loss-making. With content costs rising, and other disruptors likely to arrive down the track (think Apple), this could be as much about reducing the cash burn, whilst also hooking up with a quality content provider. We will be watching this space closely for any developments. No one rings the bell near the top, but perhaps we have seen it with the departure of Simon Moutter. Is he leaving in John Key- like fashion? Only time will tell. From a charting perspective, Spark still looks quite strong, but we recommend that holders of the stock take a little bit off the table. Disclosure: Interests associated with Fat Prophets hold shares in Spark New Zealand.